Passengers are welcome to board our ship at 6:00 p.m. After comfortably settling into your cabins, we'll introduce our crew at a welcome cocktail and evening. We will cruise towards Pauillac. Join us on an excursion for both packages: Helicopter ride - fly over the gorgeous Médoc! Experience a bird's eye view of the numerous châteaux and famous vineyards that give the region its reputation. It's a once in a lifetime experience! **Unavailble from April to the end of June. We'll begin to cruise early this morning along the Dordogne River towards Libourne. Upon arrival, join us on an excursion for both packages: tour of Saint-Emilion. Enjoy an evening of entertainment. DISCOVERY: Guided tour on foot of the hillsides in Cadillac. Your walk will take you through the city before a visit of some of the wine cellars followed by a tasting of local specialties and wines. DISCOVERY: Visit to La Cité du Vin and wine-tasting. Afterwards, we'll return on board for our gala dinner and evening. For the safety of our passengers, the captain and crew of the boat may decide to modify the navigational itinerary. The cruise schedule may vary according to tides and arrival times at ports of call may be subject to change. 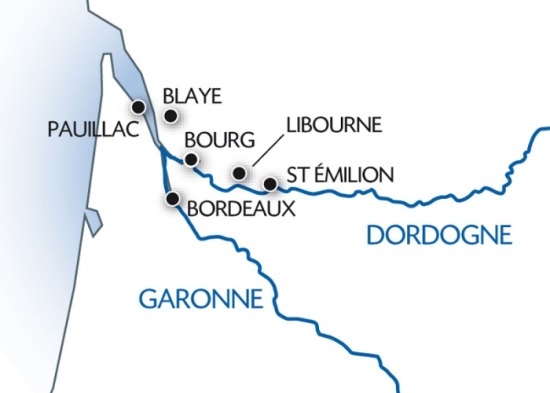 Depending on docking availability, the stopover in Pauillac may be replaced by Cussac-Fort-Médoc and Blaye and Libourne by Bourg. The helicopter ride excursion on Day 2 must be booked in advance. Subject to availability and favorable weather conditions.